When I pick up the Sunday paper in the morning I flip through the business section because it may having something I can use to write about, but mostly I just pull out the coupons and flip through them in 5 minutes, cutting out the few that capture my attention. Is the paper worth subscribing to any longer? At 3.25 a month for 4 Sunday (and Saturday) papers I am still unsure if the value is there. Some Sundays I find absolutely nothing in the coupons section. Plus I can always print out my needed coupons from online sources for the cost of ink. Ultimately the decision was to keep the paper as I found that an extra coupon is always nice when I can only print out 1 or 2 from an online source for a good deal. Also, if I can make back the 81¢ each week then it is worth it. But the coupons were the deciding factor for me in determining value. 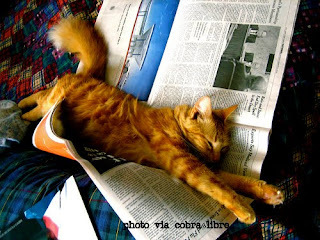 What has been your deciding factor for keeping or quitting a subscription to the Sunday paper? I'm thinking that if I'm having a REALLY bad day and my stove, oven and microwave were on the blink I could still cook a hot meal with help from my dishwasher! Yes, there is even a book out on this very idea for those who have shunned the stove and microwave and found only the dishwasher fits into their lifestyle. No more cold meals for you, no way - cook yourself up some dishwasher chicken, hot dogs, or vegetables. Jim has been punching out some good articles for me lately and I liked the list he gathered so we all can get some free specialty consumer reports that we usually don't think to get. There is more than the 3 credit reports but also the employment history reports, the tenant history reports and the insurance resports. Let's not forget the check system files or the personal information files. Definitely worth checking out to see if it is correct. First an answer to your question on sunday papers: I quit taking a paper years ago due to cost and waste. I was getting enough coupons out of the paper to pay for it, but then I switched to a diet of more local and organic foods (costs went up...coupon opportunities from the paper went down). I do need newspapers for vermicomposting and lining the hamster pen and things so I get those from work or a radio station I volunteer with. The links today are great! We don't get the paper at all. We get most of our news online and my in-laws bring us the coupons. I also work with the newspapers at work and gather the coupons there. But the few times they do bring us the paper, I've used it to clean our mirrors and windows. It's wonderful and streakless! What will crazy old coots do without newspapers to hoard and stack all over their houses? Without newspapers, kids won't be able to make paper mache pinatas. What will we line our garage floors with when painting furniture? Newspapers simply can't die! One thought we had on the dishwasher cooking: We wonder how much water is used to cook a meal, and also how much extra power is used for the 'temperature-boost' feature, to get the dishwasher hotter? Just a thought. Interesting concept, though. I might see if I can find the book of dishwasher recipes at the library, just for the fun of it. To me the only reason to the get the Sunday newspaper is for the coupons. The actual "news" is already old, and there are plenty of online sources. I haven't gotten a Sunday paper is years, and am not likely to go back to it. I get the paper at the dollar store. They're available by noon on Sundays at both 99cent Only (a southwest chain) and Dollar Tree (coast to coast). I still do get the Boston Sunday Globe (at $4.00/week) and most weeks also the local Sunday paper ($2.50). Reading both papers and doing the Sunday puzzles over a relaxing breakfast is one of the better parts of my week.